Lately I’ve been reading about hunting, to explore this new interest my son has. Something struck me that I never really thought about before; just like how in birding it is not enough to just know how to identify your species but one should also know its habits, hunting is more than just aiming a weapon at an animal and taking it down. I was aware that stalking and hiding was important in the hunting paradigm, but it is the observation of the relationship between the animal and its environment that is critical in being efficient in the hunt. You have to know where and when that animal might head to water, or what and when it eats, how it spends its day, what its mating rituals are like. Knowing these things about deer, for instance, might reduce the amount of time a hunter has to sit in a stand waiting for that big buck to stroll along. This thought process helped me realize that although I might be an animal behaviorist by trade, many people are animal behaviorists in their own right. If we just counted just the hunters and birders, that would be about 60 million people in the US, according to the USFWS National Survey. That many people become special experts in the wild animals they are trying to track down, observe, and capture with a camera or a gun. I was curious about the migratory habits and changes in animal population from season to season and year to year around my own little area. I decided to do a little behavior observation via bicycle and make some notes that I will then compare season to season or year to year. Like a hunter who goes to visit his deer lease ahead of hunting season to get a feel for how the animals utilize their land, I wanted to see if I could get a feel for what the habits were of the wild birds here near Seven Meadows and Cinco Ranch. Seventh Heaven Duck Pond: Lesser Yellow Legs 1, Muscovy Ducks 7, Grackel 2, Mourning Dove 2. Usually there are about 32 Muscovies in this pond, so this observation confirmed my hypothesis that the ducks had been wandering away. I think the reason why has to do with food resources, but I am not sure it doesn’t have to do with mating as well. I am fairly certain it has nothing to do with migration, since I am assuming this is a year round non-migratory domestic species. I have never seen the Lesser Yellow Legs there, so I am thinking this is a temporary migrant. Little Bridge/Pocket Park: Little Blue Heron 1, Muscovy 5. 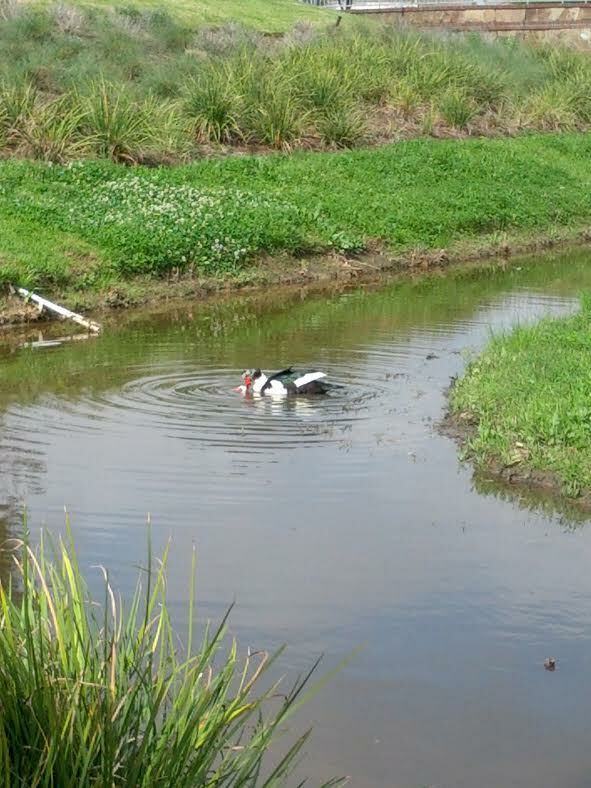 Two of the Muscovies were mating, which seemed like a traumatic process for the female. The male was biting her neck and pushing her under water for a considerable amount of time. When they were finished, she got out and shook the water out of her feathers, and later we saw them foraging together, so I guess it wasn’t too terrible for her. “That’s just nature!”, we said before we took off. Oasis: this is the pocket park in my neighborhood where I described seeing the flock of Cedar Waxwings earlier this year. Today, all we saw were two blue jays. “A” Bridge: we thought we would see a lot of action here, but it was surprisingly devoid of birds. We heard, but didn’t see at first, a couple of grackels, doves, and mockingbirds. As we watched, a blue jay appeared, and then we spied three grackels across the water. An unidentified bird flew off with something in its mouth. There was a nice patch of bluebonnets here. As we passed them, we approached a larger part of the pond that appeared to have three new kinds of ducks in it, so I got excited for a minute and realized these were the three that I have seen driving by before and have been wanting to identify. Then J pointed out that they sat really still for ducks, and when we looked with the binoculars, we were able to confirm that his suspicion was correct – they were only decoys! Why, I wondered, and he thought it was to attract other birds/ducks to the pond. Cinco Park Nature Trail Big Pond (or Little Lake): there was a lot of activity here. There is an island in the middle (where a cache is – we have taken the canoe out to it before) where 2, then one more so 3, Great Blue Herons stood. In front of them, a group of four ducks were swimming leisurely. One was an American Coot, but the other three were too far away for us to firmly identify. We think they were Gadwalls. Three White Ibis hunted the opposite shoreline for food, and a Great Egret stood nearby them. Another of these large Egrets stood at the shoreline on the same side as us. Four Muscovies also hunted for food close to the shore near us, near a tiny cove area sheltered by a small tree. Four cormorants dove for fish to the left of us in the water, and two vultures circled the sky closer and closer to us, until we finally decided maybe they thought we were standing still long enough to be dying animals, so we biked off. The other night, we were watching Cosmos and Neil deGrasse Tyson was talking about early humans, how they learned to match the weather and star patterns to the migratory patterns of animals to help them be more successful in the hunt. That is what I am trying to do, only the intention of my hunt is simple knowledge. We were having a talk about vultures at lunch, my kids and I. The older one made a statement like, “no one wants to see vultures,” and the little one wanted to know why. It was postulated that seeing a high number of vultures could be an indication that something is wrong with the environment. As it turns out, it might be the other way around, for it is the decline of vultures in other areas that may actually demonstrate a natural imbalance. While it is true that in North America, we have made the world a better place for vultures (by the increase in roadkill and decrease in vulture persecution by farmers), this is not a boon seen across the board. In fact, in India, the vulture population decreased by 99% by 2008, leaving very little of these large, although unsightly, incredibly useful birds. Of all the reasons why these large carrion eaters have been reducing in such significant numbers in India, the biggest reason is the use of Diclofenac, which is a painkiller administered to cattle. The cattle carcasses were a large part of the diet of vultures in that area, and the painkiller was poisoning the birds. The birds do not have a critical enzyme needed to break down the medication and die within three days of renal failure after consuming this meat. The use of this drug was banned in 2006, and numbers show a slight increase between 2011 and 2012, so that is good news. DDT has also played a role, as this pesticide was dumped in high quantities in a national park in order to quell malaria rates. High levels of DDT were being found in the flesh of cows, left for vultures to feed on due to Hindu practices regarding the revered cud chewers. However, it is not just India that has seen a significant decrease in vulture population. Nepal shares many of the same reasons for decline of the vulture population within its borders as India. Africa has also seen its fair share of vulture decline, also due in some part to the use of Diclofenac, but also due to the use of a pesticide called Furadan that farmers lace carcasses with to reduce herd loss from carnivores. Since each carcass can feed up to 150 vultures, this leaves a huge unintended consequence of the dying off of these useful birds. Some of the deaths are also attributed to the use of vultures by shamans in mystical ceremonies that commonly involve the use of this animals brain in ceremonies. It is believe that the vulture brain (either through smoking, eating, or smearing on the body) imbues on the recipient powers of clairvoyance or increased intelligence. The black market sale of these birds leads to the disappearance of roughly 59,000 birds a year. In the US, we have also had our losses over the years. During 1946-1970, vulture numbers dropped off, like the other large birds of prey, due to the widespread use of DDT. This pesticide was discovered to thin the shells of these big birds, decreasing the ability of the offspring to survive. However, since the use of this has been banned, the numbers have rebounded, and it seems like here in Texas, you can’t hardly look at the sky without seeing one floating about. I think it is interesting to note that before 1920, the ubiquitous Black Vulture was not common to Texas. It was not until a change in agricultural practices that they became permanent residents. The truth is also that the vulture population follows the white deer population. Since Texas has the largest population of white tailed deer of all the states, it makes sense that we would also see high numbers of vultures here. So in our case, seeing the vultures IS something we want to see, because it indicates the health of the system, not the other way around, like we speculated at lunch. It means our wildlife is flourishing, and that pesticides (at leas those that affect the birds) are not leaking into the environment at such levels that they are having an impact on population levels, that our farmers aren’t leaving laced carcasses meant to discourage large predators, and that we don’t eat their brains. 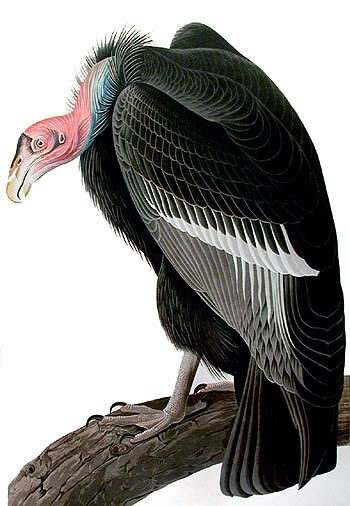 It could just be, though, that no one wants to see the vultures because they are just not attractive birds. Their heads are bare to keep them clean when eating carcasses, but it makes them look funny. They don’t have flashy colors to their feathers, and their eating habits make us feel disgusted. However, they perform a useful task in cleaning up the environment of the collective dead things. Without them, the risk of disease spread goes up. If you don’t believe me on this, ask India. They now have issues with increasing feral dog populations and water contamination from their lack of vultures. I myself find the vultures boring and commonplace, but after today’s research (what better way to spend a non-snow snow day), I understand why there are so many of them, and it makes me feel comforted. Last Friday, three of us were watching “Where the Wild Things Are”: J, myself, and the little one. About halfway through, the little one wondered if we were going to turn it off soon. When I asked why, he answered that it was scaring him. He couldn’t handle the wild rumpus. He asked me if those things were real, and I explained to him that it was just a story that someone invented to help children deal with their fears. “But what if they ARE real, Mom?” he asked me, very concerned. There’s nothing to be scared of, child. The wild things aren’t real. Except that they are, sometimes. Just not in the way he thinks. 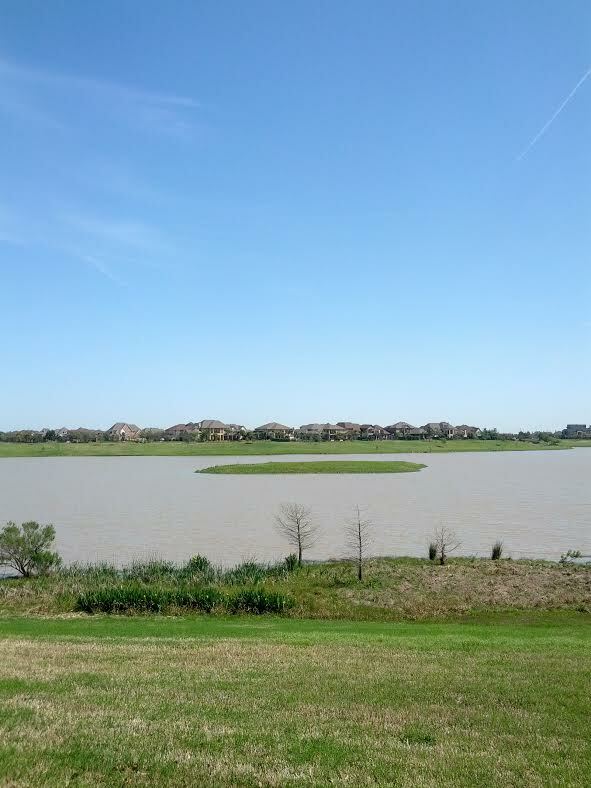 A few days later, I was walking my dogs out along a nearby bayou. We were walking along the footpath, and I was scouting for birds. Peeps and chips indicated the birds were all around me, but the sun was going down, and I was having a hard time spotting them in the little field binocs I had. The dogs were all excited because they had been flushing small game out of the brush along the way. When I heard the fluttering of brush to my right, at first I thought it was just another rabbit, but then I realized that it was something much larger. Then I heard this peculiar sound, a wuf-wuf, the snuffling of an animal trying to fix a smell in his nostrils to make an identification. Trepidation filled me, and despite my very strong inclination to continue down the trail, I realized that would be a bad idea. It was a wild thing party, and I had brought the predators. I am not sure if the dogs on the other end of my leash were akin to bringing a gun to a knife fight or the other way around, but I didn’t want to find out. A couple of months ago, the kids and I were driving to a football game, and we spotted the incongruous sight of a coyote booking it across busy 99. A few days after, I saw a dead coyote near the same spot. On the same road but much further south, on my daily commute down past the farms and the prison on the way towards Stafford, dead coyotes leer up at me from the side of the road, frozen in the grim smile of death. I feel for the coyote, whose home range we have slowly been destroying in order to feed the need of expansion. In Bellaire, the only good coyote is a dead coyote, or at least a relocated one. Residents have been complaining about a pack of them that are living in what little is left of their world – a small tract of land between power lines. Coyotes have to adapt to the urban environment, or die off. Nobody wants a wild thing eating their house cats and small fluffy dogs. It’s nothing to be scared of, my child. Monsters aren’t real. But big birds are. Last night, when the husband came home, he was preoccupied. He was looking for his binoculars, and for the super flashlight. There was an owl outside, and he wanted to get a look. We were all ready to celebrate his birthday, but instead he said, come look. I peeked through the scope to see a large dark body on the power line, eyes glowing in the night. 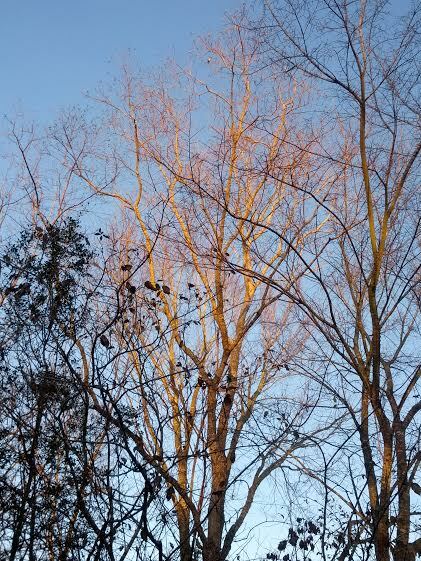 Then he cast the light of 250 lumens on it, and it lit up like broad daylight – and I was looking at the dark brown and golden feathers of the Great Horned Owl, who turned to look at us but didn’t fly away. I asked J how he knew he was there, and he said he heard him. This morning, as I got in my car, I heard him again, and it made me smile, and it made me think about that movie again, that movie in which monsters are teaching a kid about what it means to be a human, and he teaches them about what it means to be a wild thing, and I thought about my little son. 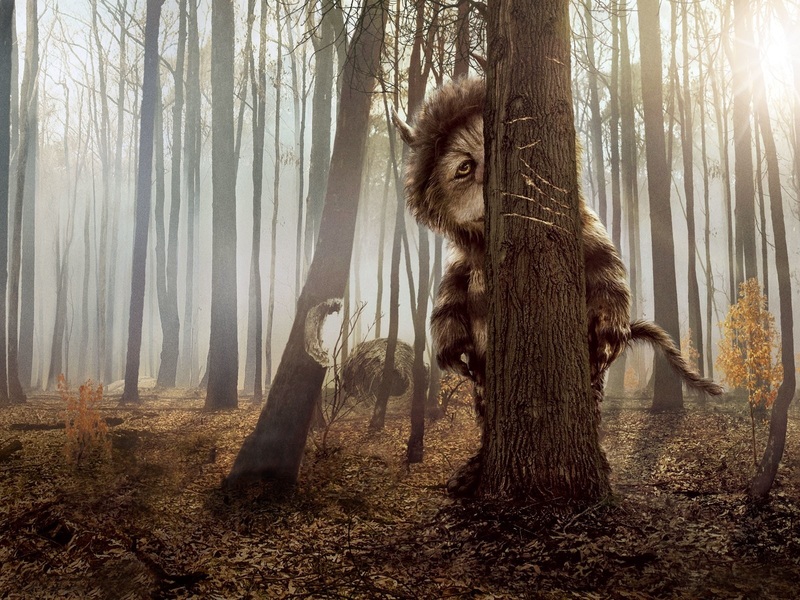 Yes, my child, the wild things are real. They are all around us, and all you have to do is look, and listen, but don’t be scared. This world, after all, belongs to them. Something I gained a new appreciation for on this morning walk, just as the sun was gaining ground in the sky and light was pushing out the darkness, was the peacefulness that sinks into one’s soul after spending some quiet time in nature. Sure, I was in an urban environment, but it didn’t seem like it. Natural elements were still all around us. I walked the dogs past a little pond near by house that has a colony of Musgovy Ducks in it. There was a Great Blue Heron that caw-ed a deep, raspy sound when we walked by, annoyed at having to move to the other side of the lake to escape from the dog danger. Zero fucks were given by the ducks, who continuing to lay in the grass languidly, or moved in slow, gentle movements across the surface of the pond. The mockingbird might seem near and dear to us, because of its ubiquitousness and the fact that it is our state bird, but we shouldn’t feel so special about the latter. It is also the state bird of Arkansas, Tennessee, Florida, and Mississippi. It is also interesting to note that the mockingbird is one species that is urban-positive, meaning that it appears in greater numbers in areas that are urban compared to rural/non-urban. It is not clear to biologists yet if this is a good thing or not; e.i. if this species is falling into an ecological trap or just benefiting from the constructs of man. 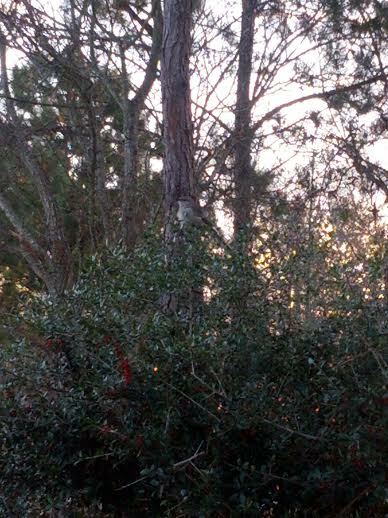 Later, I came upon another mockingbird, and took this video. She was singing this song as I came upon her, and kept on even though the dogs and I were directly below. Possibly it was a male – the males are slightly bigger than females, but that is the only difference. The males might sing more often and longer to attract mates; the singing repertoire is a means of sexual selection in both males and females. I realize this video is sideways, can’t seem to edit it on here. It does not detract from the quality of this Northern Mockingbird’s song, though. I myself had tended to take the mockingbird for granted, but after pausing to listen to this one’s song for a while and learning some information about them, I gained a new appreciation for them. Another thing I gained a new appreciation for was both this little oasis in a section of nearby neighborhood, and the benefits to sitting still in nature for a while. I have always like this one little area where the developers decided to put in a little garden with stone steps leading up to a small bubbling fountain and a variety of plants and trees. There used to be a poorly maintained cache there, which has been replaced with a well-camouflaged one. I sat down on the edge of the fountain, dogs resting their bums on the dampened dirt gravel path, so I could listen to the birds and try to identify some. A few mourning doves flew off as I approached, but soon the trees around me, like the one in the picture at the top of this entry, were besieged by smaller birds who were peeping and twittering among themselves. Their breasts seemed to glow golden in the morning sunlight then fade to a yellowish as they turned to the side, little crowned heads bobbing up and down. 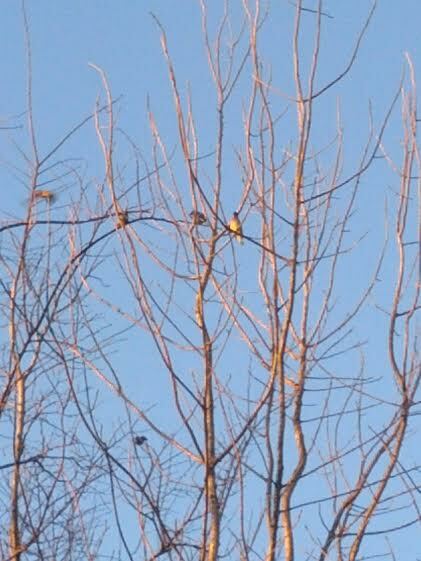 I finally figured out after much watching that they were Cedar Waxwings. Very cool. When I got up to leave, my whole body felt so relaxed, free of pain or discomfort. It was very soothing, and that is a moment I will hold on to during the stress of the work week. I need to go back there often, both to watch the birds and to get that feeling, a feeling like I had just come from a massage table or drank a few glasses of wine. All this activity made me think about a few things. I thought about Rachel Carson’s book “Silent Spring”, and what it would actually feel like to live in a world absent of birds around us. I thought about Italy and Albania, where hunters are literally wiping out all the migrating birds, where one can walk for hours and not hear birds at all. I rationalized my recent obsession with birds by listing the reasons in my head why they were compelling: curiosity about the world around us, the true free nature of birds, the concept that they are a sentinels – a group of animals that can stand as indicators of the health of our environment. Part of my interest is because of J, because he has taught me to look up instead of down, to be happy instead of miserable, to reach for my dreams instead of wallowing in lost chances, to pay attention to the marvels of the environment around us instead of being stuck in an inner dialogue. Those are the reasons why I am carrying around a “Birds of Texas” book and recording species observed lately. This week, I was able to identify at least one of the hawks seen along my commute as a Red Tailed, and also spotted an American Kestrel sitting on a utility pole. Also, I had some sightings of birds (Blue Jays) out the window during a work meeting, Earlier in the week, the kids and I were at the museum downtown, and a bird was on the porch peeping and seeking food in the dirt that I am fairly certain was an Eastern Towhee. So new species recorded for the week include that hawk, kestrel and towhee, the Muscovy Ducks, Northern Mockingbird, Cedar Waxwings, and Mourning Doves. Species count update: 27.